D Sireesha's vision problem went unidentified until she was in her 6th grade. 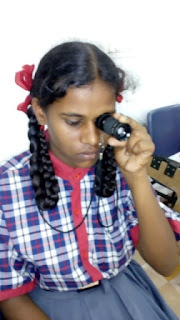 When her teacher tried to counsel her on her low scores, she realized that Sireesha was unable to copy notes from the blackboard due to limited vision. Soon enough, her agriculturist father brought her to LVPEI's Edward and Soona Brown Eye Centre at Sattenapalli. Diagnosed with low vision at the centre, she was prescribed with 4X telescope. "I am in seventh grade now and I am able to study well. In my last exam I scored 70% and I am now participating in all school activities as well," says the elated Sireesha.